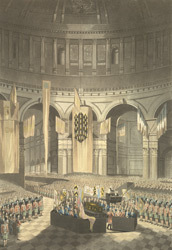 Nelson was given a splendid state funeral and burial in St Paul's Cathedral in 1806. The ceremony was attended by officers of Nelson's ship (the Victory), admirals and captains of the fleet, and most of the royal family. Nelson's coffin was then lowered into the crypt, into a sarcophagus intended for Cardinal Wolsey.